For anyone that listens to Christian radio in Atlanta (or maybe anywhere) regularly, this will sound like a really lame broken record. But, the core idea of the drive-thru difference is really awesome and I want to share it, with those of you who haven’t heard of it, as this week’s suggestion of how to change the world. Basically, the “drive-thru difference”, as it has been termed, is where you go through the drive through of any place you would normally go through the drive-through, whether you’re picking up a fair trade latte at Dunkin Donuts or a meal at Wendy’s, and as you pay for your meal, you also pay for the meal of the car behind you. You can choose to leave an encouraging note for that person, or just do so anonymously. 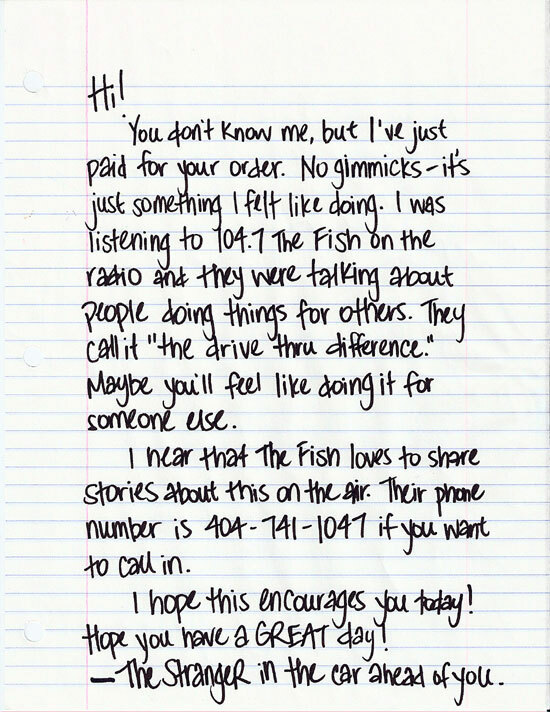 Sample letter to leave at the cashier from the radio station I heard about this on. “How does this change the world?”, you may ask. Great question. It changes the world in the same way smiling at someone who has had a bad day changes the world. One person at a time. The great thing about this is that it shows God’s love to a stranger in a tangible way. Also, it will probably make the cashier’s day a little brighter. I know when I worked a minimum wage job in retail, it was always more fun to help people shop for gifts than for something for themselves. People love seeing generosity. Maybe you’re like me, and can barely remember the last time you went through a drive-thru. If that’s the case, think of how you can apply this in an even bigger way. Maybe leaving a gift card at the register for doing this at the grocery store (just check to make sure the person behind you isn’t buying for one those crazy-big-TLC-show-sized families). 1. Have you ever done the drive-thru difference? 2. What is one way to apply this same concept for people that don’t use drive-thru windows so much?